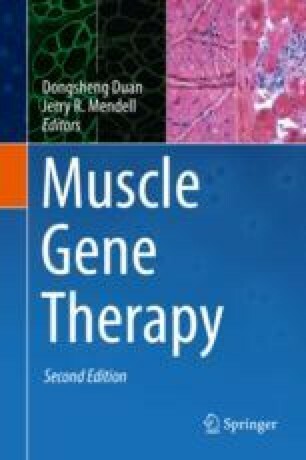 This chapter reviews the discovery of the Duchenne muscular dystrophy (DMD) gene, early attempts at plasmid-mediated DMD gene delivery and its limitations for clinical efficacy, and modifying the DMD cDNA to circumvent the obstacle of packaging in adeno-associated virus (AAV). The unfortunate events of the Jesse Gelsinger death are briefly discussed. The essence of the chapter is the review of the first clinical experience of DMD gene therapy using a mini-dystrophin and the challenges for immune responses. The potential way forward where possible to avoid these problems is fully described. In addition to DMD, our experience in limb girdle muscular dystrophy 2D (LGMD2D), alpha-sarcoglycan, gene therapy in clinical trial is also described. Success was achieved with long-term gene expression following intramuscular delivery, but again we encountered an obstacle for delivery related to pre-existing immunity to AAV. The lessons learned from these clinical trials provide a template and a path for additional clinical trials for muscular dystrophies. This work was supported by the National Institute of Arthritis and Musculoskeletal and Skin Diseases, National Institutes of Health 1U54NS055958, NIH Grant1R01 AI060388, Parent Project Muscular Dystrophy, the Muscular Dystrophy Association, and Jesse’s Journey and performed under FDA IND# BB-IND 13434.